Reasonable resistance to chemical agents etc. Isotropic magnets: These are widely used for daily necessary industry and seen in toys, family education, printing and decoration etc. 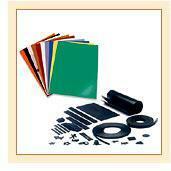 Anisotropic magnets: These rubber magnets are made by extrusion or injection. Properties like high elasticity, flexibility and machine ability make these magnets a favorite choice for many permanent magnet applications in industry and in home appliances.